Fight for truth. more and more,for ever….. But Fasten your Seatbell,s in this end fight against the Dragon Death and destruction “Zionisrael“ Hitler Fascism, is Incarnated in Judeo Fascism, a death-cult the only thing they scared is The Truth. And milions and milions know The Thruth now. And Visible will be all the murderers slaugther and Merciless. But it is soon theire death end,Live and Love and compassion will Prevail. ***Paul*** The Netherlands. Very well expressed Mr. Amayreh- The people of Gaza as well as the West Bank would whole heartedly scream” Give me liberty or give me death” without knowing that an American by the name of Patrick Henry said it many years ago. Freedom is what each Palestinian yearns for and it is time he gets it. Please ask lots people to sign your letter and present it to the white house. You got a very good point. If American know the truth, there is no way they will back Israel. The US government and media have lied to the public. Trust me, I am Chinese live in America for more than 10 years, 99% Americans are very kind and good people with outstanding moral. But most of them do not know the truth. I was disappointed by Obama’s first comment on Gaza as well. But I think I will do the same thing as his did: keep silence before became president, slightly lean towards to Israel at the beginning. He is too young and inexperience, he caught unguarded during an interview before he became president, mentioned he would engage Syria and Iran to the discussion table about the gaza conflict. You know what, the pro-Israel people are jump all over him to force him back to pro-Israel agenda before he sworn in. It’s not about Obama know what justice is, it’s the question of how does he win the battle against the overwhelming pro-Israel political environment in the US. Muslim world must be patient with him, hopefully he still remember he still care about the little guy. He appointed an Arab-American as middle east envoy, suspend the pro-Israel Dennis Ross as potential envoy, as well he showed great sympathy on Palestinian at his first comment. All of these Bush will refuse to do, Muslim should feel some relief from this. I have to say the Jewish is more sophisticated on steering Washington’s policy, while the Muslim just sit and whine about the injustice. I don’t mean to put Muslim down, you need to remember Muslim culture is very different from American culture. American expect you to make your case, Muslim is waiting for someone to bring justice on them, the Jewish is proactively bend the rule to bring “justice” to them in an extremely selfish way. Terrorism act won’t get what you want, only bring the west side with Israel. Bush was the least pro-Israel president before 9/11 attack, many Zionists complained he didn’t support Israel enough, but he turn 180 degree after 9/11 attack. 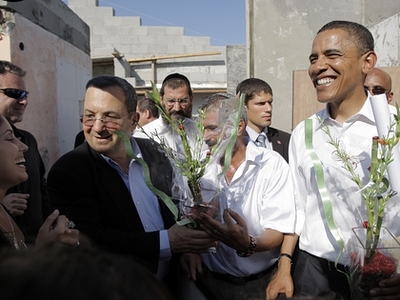 Became the most generous president to the Israelis in US history. I have to say Muslims are not very good at strategy thinking, why you have to drag the world’s most powerful country to your enemy side? In stead, you should learn from the Jewish, bring US to your side. After Bush invaded Iraq( of cause he was too dumb and let the Zionists talked him into it.) Terrorism act by Muslim have spread through the west. I can understand Muslim’s frustration and detestation, but why Muslims have to expand your enemy base, from Israel alone to USA, then the entire west, do you think you can win? there is no winner if Muslim and the west are enemy. Life is tough, life is not always fair, you have to bring the powerful man side with you, not expecting the powerful man to side with you automatically. Don’t accept what “faith” bring to you, CHANGE it with your brain just like the Jewish. If you are Muslim you may not like what I am saying, but I am honest. Good luck, and may God/Allah bring peace to the world. After Obama won the elections there was some talk in the US that something big will take place to test Obama, was it Gaza? If that was the case, Obama has so dismally failed, to those of us who thought that he would bring change to the Palestinians & to the Middle-East. Like the Presidents before him he has caved into Zionist pressure he is another coward who has totally ignored the Palestinian cause. @ShueF – “99% Americans are very kind and good people with outstanding moral” – This just tells it all about your “outstanding moral”. @paul – eye for an eye can no longer happen in the 21 century. there will be no solution with that attitude. through the action of nonviolence we can show the flaws of our enenmy. martin luther king show us great ways to fight injustice. gandi showed us how to overcome injustice. with a movement of civil rights with nonviolence people will have to listen . changes will have to happen .we people of many bodies join together with the one mind of peace and justice there will be nothing we cant achieve. people with pure hearts of compassion will be victorious. we will see a two state solution we will see civil liberties for all through the power of the people with nonviolent actions.